St. Patty’s day is around the corner (March 17th), so do you have any plans? I can say that my plans have definitely evolved with my age. It used to be like a national holiday in my teen & early twenties, right up there with the May party long weekend. It tapered off a bit in my later twenties, kinda turned the dial down from an 11 to maybe a 7. Now I’m not sure I can recall what I did the past couple years. Probably met up with a few friends at non-Irish pub because we’re too old to deal with line-ups and crowds and “kiss me, I’m Irish” tight t-shirts. Who am I kidding, I would still wear the t-shirt if my abs were as tight as the shirt. These days I just love any excuse to make some green coloured food. What I would really love is to have a whole green themed dinner party with appetizers, mains, sides and dessert all green & gourmet. Maybe next year? 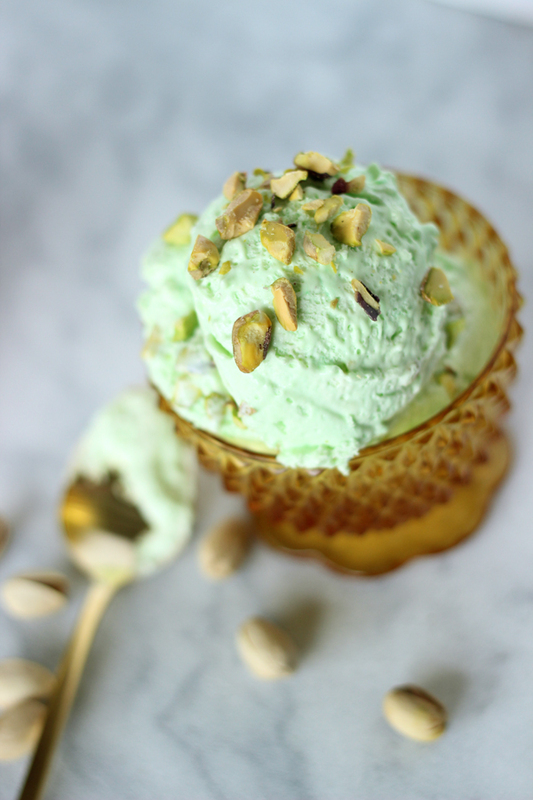 For now here’s a green, delicious and easy no-churn pistachio ice cream recipe. I got this recipe from my blogger pal Jesseca at One Sweet Appetite and kinda added my own twist to it. It’s soooo easy and you don’t need an ice cream machine. It’s basically a two ingredient recipe and then you can add whatever extra flavors you like. This recipe really can’t be any easier. 1. whip the cream until it makes stiff peaks. 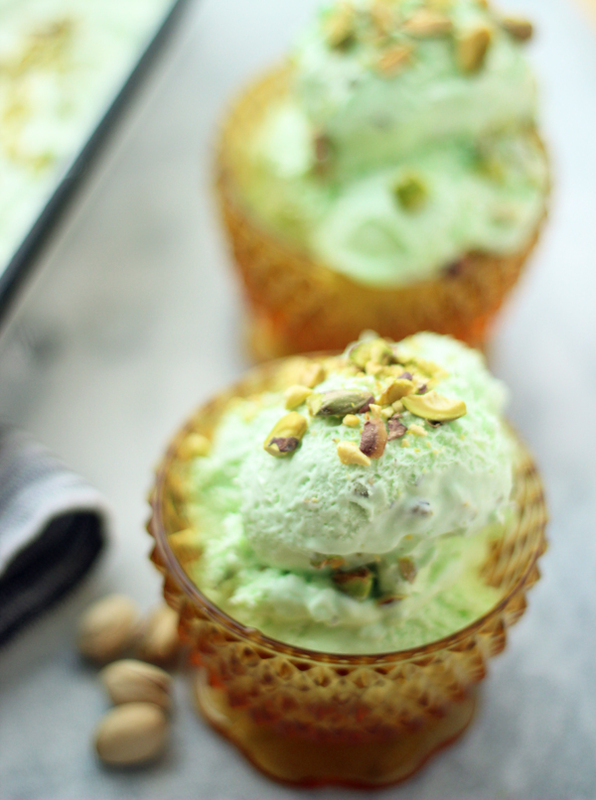 2. combine the condensed milk, 1/2 cup of the pistachios & pudding mix together until blended. 3. fold in the whip cream with the condensed milk mixture. Add some green food coloring if you want a more intense shade of green. 4. pour into glass or metal container, close air tight lid or cover well with plastic wrap and place in freezer for a min. of 6 hours, preferably overnight. 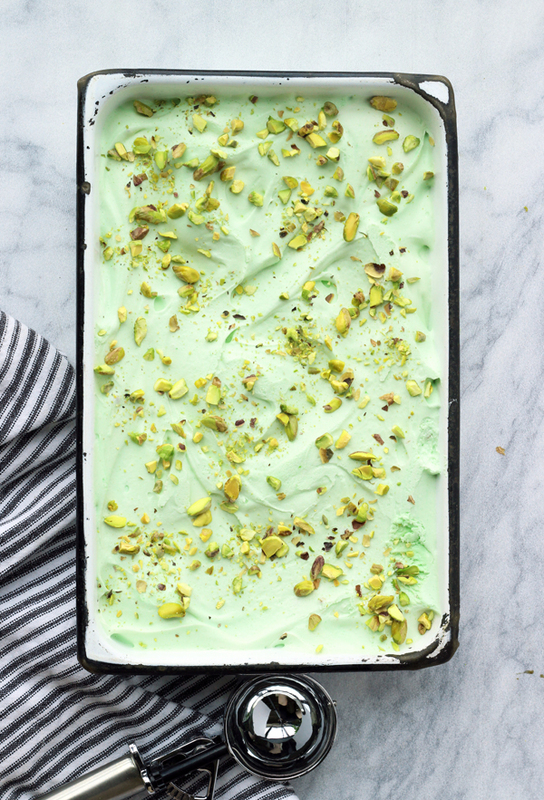 Remove from freezer about 15-20 minutes before you want to serve, sprinkle with the remaining 1/4 cup crushed pistachios and you’re good to go! 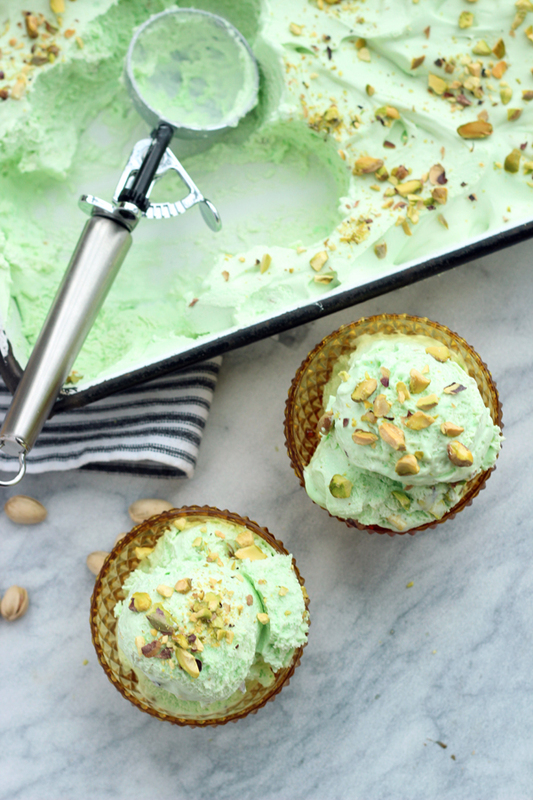 You’ll have a creamy and delicious green treat to celebrate St.Patrick’s day, or any day really. Don’t be afraid to add some chocolate syrup if you want. Nothing wrong with that. Nothing at all. Thanks again to One Sweet Appetite for the recipe. I’m definitely going to be trying a bunch more different flavors. Next up will be coffee for sure. If you like this recipe, you can find more in our Good Eats recipe gallery. Enjoy and Happy St. Patrick’s day friends! Looks amazing, can’t wait to try it!! which size instant pudding did you use – smaller box or larger box? We just have one size here in Canada, I’m guessing it’s small. Should the pistachios be salted? Roasted? 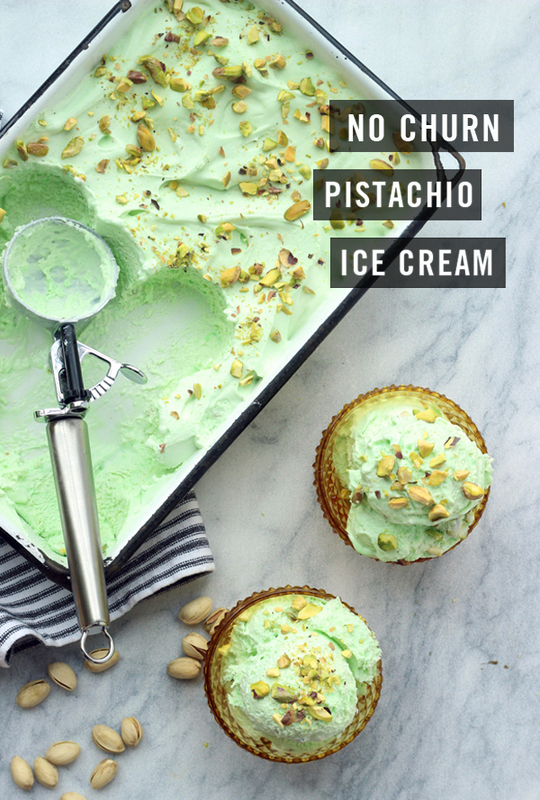 I’m excited to try the recipe, but want to make sure I get the best kind of pistachios! I would use unsalted if you can find them or else I don’t think salted ones will ruin the recipe. Good luck! Can this still be made in an ice cream maker? Do all of the steps and then add to the ice cream maker prior to putting it in the freezer? Hi Melissa, I’m not positive of the answer for that, so sorry. I’ve never used an ice cream maker so I’m not sure how the process is different. What is the estimated YIELD? Think a bread pan full. You can double the recipe if you want more. 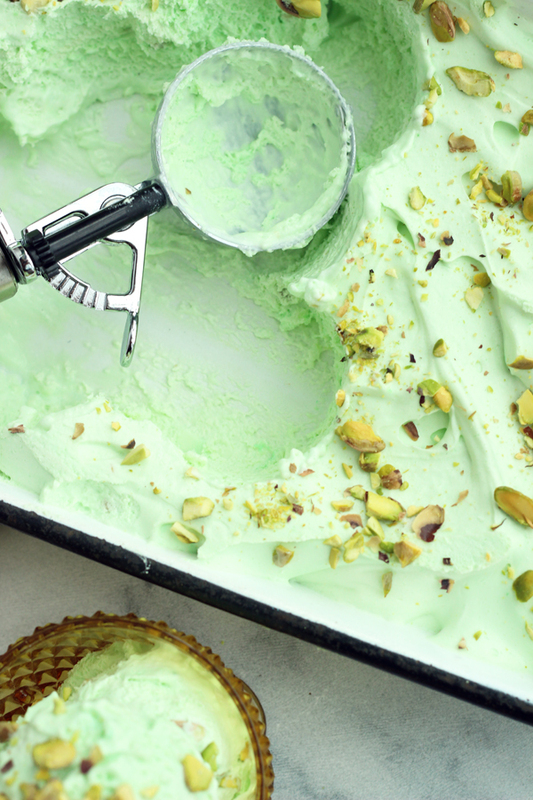 Thanks so much for this recipe, I have literally just finished making this for my mum as she really fancied it…I’ve just sent it over to hers to freeze and try when ready….only instead of using the instant pudding you’d suggested, I’d used pistachio paste as that’s all I could find here in the U.K…hope it will work? Tasted good when I dished it out into the container anyway!! Do you think it will compromise the consistency in any way? HI! I made this the other day and I wonder if maybe the cream should only be beaten to soft peaks? 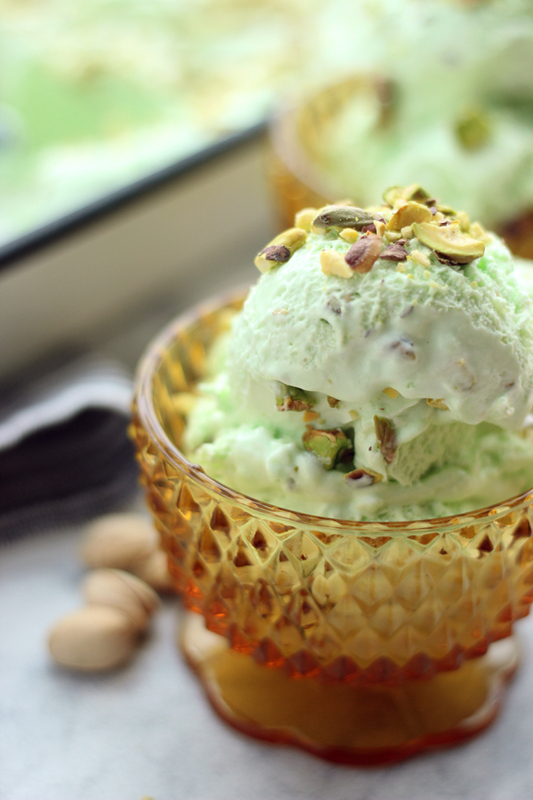 The flavour is delicious, but the end result was a whipped pistachio fluff; definitely not ice cream. Is that how it is supposed to be? I really wanted this to work!